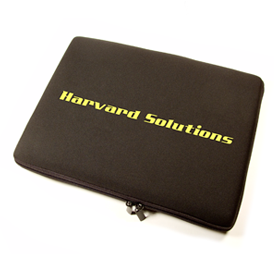 Protect your computer and other electronic devices while on-the-go with our high quality fully custom neoprene sleeves. 60.00 (G) sample charge plus set-up charges. Sample charge is refunded with order placed. Please add 2 weeks to delivery. Overnight shipping charges apply. Please note the cost of a random sample is the EQP of the particular style and size desired. Samples can be shipped on a FedEx or UPS account number or there is a $6.50 shipping charge. Not all sizes and styles are available as a random sample.